Home - ART at Mayfield Woods Middle School! You know all those videos, websites, and images we look at in class? Do you ever want to check them out again on your own time, when you get home? Well, you're in luck! Visit the NEW "Art Room Docs" page (found on the left hand side of this site) and click on the links to take a look at what we've covered in class. Unfortunately, some of the Powerpoints I show in class are too large to upload to this site. I've uploaded the ones that will fit. Hopefully in the future, I'll be able to upload them all! CLICK HERE TO GO TO ART ROOM DOCS! 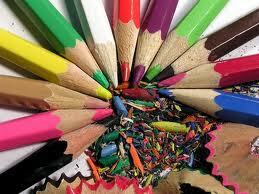 Bring a sharpened pencil with an eraser to Art each day! Come prepared to discuss, critique, and create artwork. Most days, we will be doing all three! Check the Art Room Blog for photo updates! Have a question? Contact me through this site or check out the FAQs. Do you know who created this artwork? What kinds of art materials do you think were used to create this image? If you were to put this artwork in a category by medium (drawing, painting, etc. ), what category would it fit in? 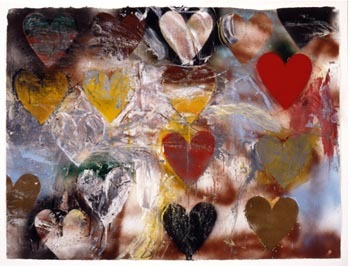 "Millions" was the answer artist Jim Dine gave when asked how many hearts he has featured in his artwork over the years. When talking about hearts as subject matter, he has said: "I use it as a template for all my emotions. It’s a landscape for everything. It’s like Indian classical music -- based on something very simple but building to a complicated structure. Within that you can do anything in the world. And that’s how I feel about my hearts." 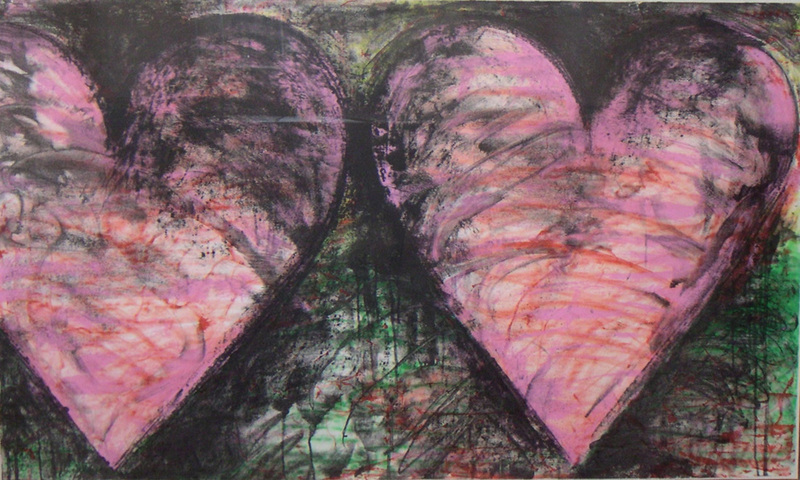 This lithograph was created by Jim Dine between 1981-1982. It's called "Fortress of the Heart". A lithograph is a drawing or image etched into a plate made of either stone or metal, and then printed onto blank paper. This lithograph is part of an edition, which means it was printed over and over to create a series of the same image. There were 22 lithographs in this edition. 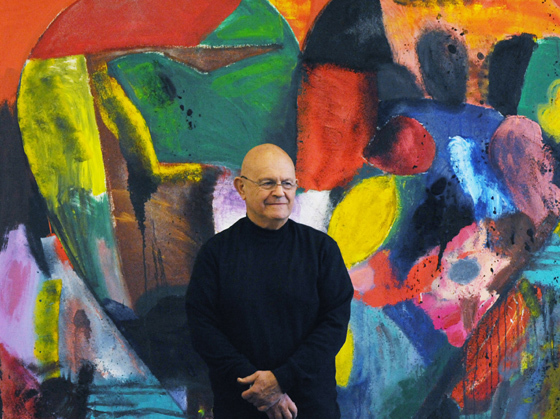 Jim Dine is still alive today, making paintings and prints regularly. You can read an interesting interview with him about his life here. 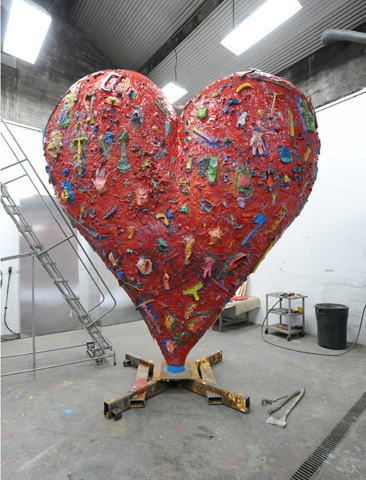 Jim Dine with one of his hearts. Jim Dine's "The Technicolor Heart"
Jim Dine's "Meadow Hearts #1"
What do you think is going on in this scene? How has the artist used composition to draw your eye in and around the artwork? Take a look at the scene in the lower left corner. Who are these people? Are they coming or going? Can't you just feel the icy air on your skin? This painting is one of six featuring different seasons. This artwork in particular gives us insights into The Little Ice Age, a time period in the 16th Century when the Earth was a colder place due to a decrease in solar activity, and large volcanic eruptions. It is an oil painting on wood, created by Dutch artist Pieter Bruegel in 1565. The name of the painting is "The Hunters in the Snow," also known as "The Return of the Hunters." In 1565, it was not typical for artists to paint images of daily life. In painting a scene featuring everyday people (as opposed to the wealthy, or royalty), Bruegel was promoting a different kind of art. Though painted skillfully, this landscape shows a mundane part of life - men and their hunting dogs returning from a hunt. Yet Bruegel uses muted colors to convey a sense of sadness or disappointment. The dogs' heads are turned down, and the men's faces hidden from view - they are not returning home with a feast. 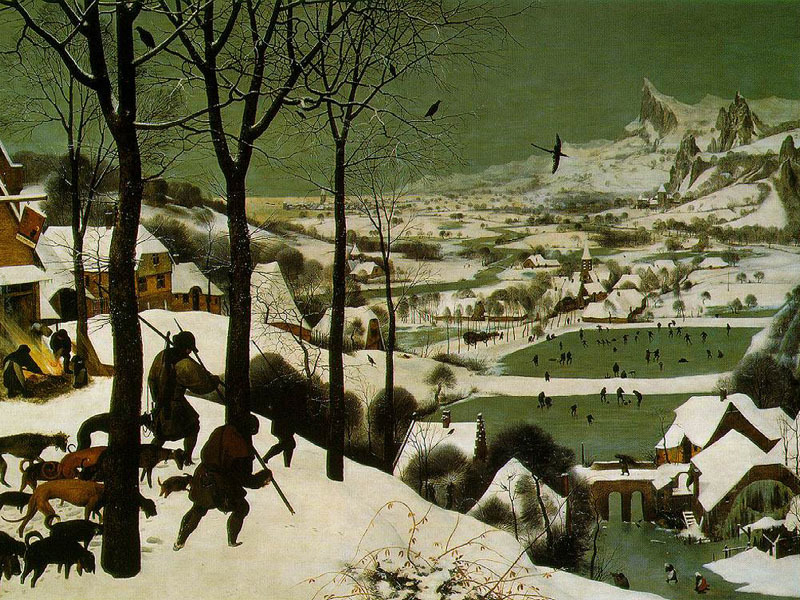 Where before this type of scene may have seemed unworthy to feature in a painting, Bruegel chose to depict it. What is the overall mood in this artwork? What seems to be the center of interest? How has the artist drawn your attention to this point? 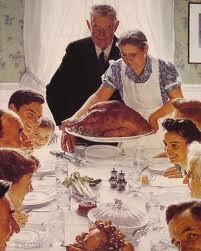 This artwork was created by an American illustrator and painter named Norman Rockwell. He lived from 1894-1978. He spent more than four decades illustrating covers for The Saturday Evening Post. The image above was published on March 6, 1943 - in the midst of World War II. 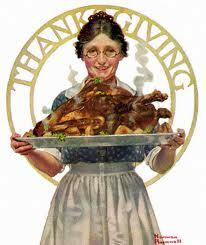 It is officially called "Freedom From Want", but is also known as "The Thanksgiving Picture." Knowing its title and the time period in which it was created, what does it make you think about? 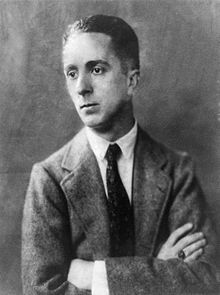 Check out more of Norman Rockwell's artwork, as well as an interactive timeline of his life here. Why do you think the artist created it? 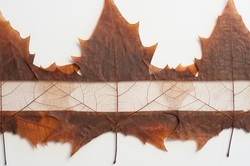 As you might have guessed, this artwork is made out of leaves. The artist, Owen Mortensen, created this artwork from Aspen leaves that he collected over the course of a year. There are 12 leaves, one from each month of the year. 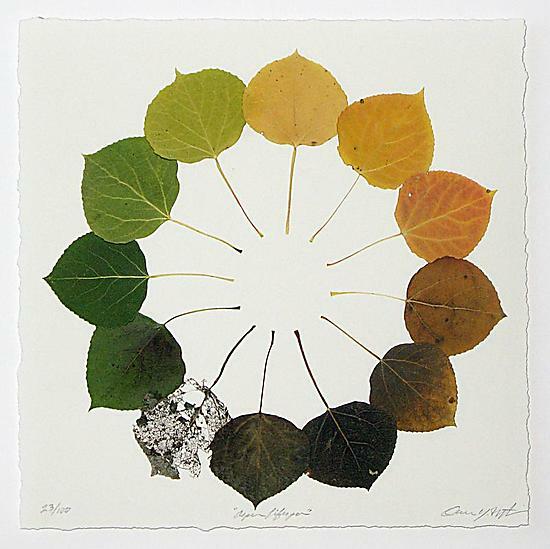 In this way, the leaves represent the cycle of life. 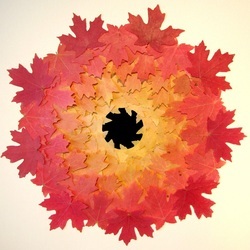 What do you think this artwork is made out of? How do you think the artist created it? 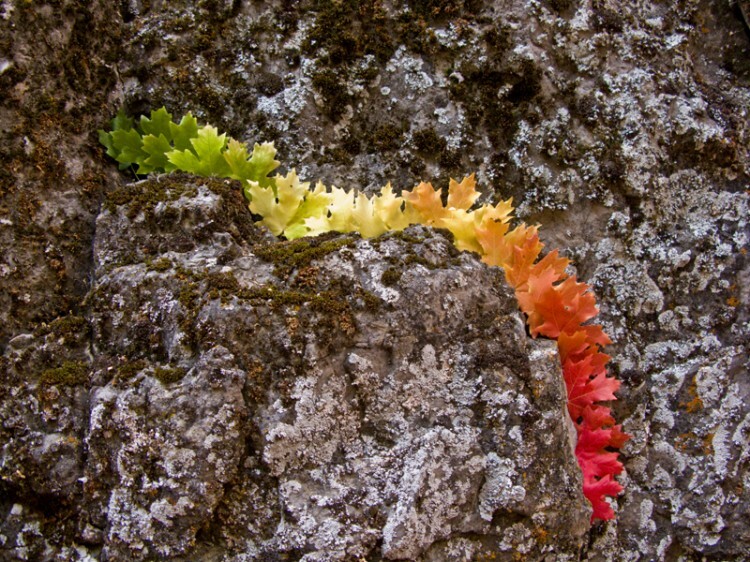 This artwork is actually a miniature sculpture created by artist Dalton Ghetti. 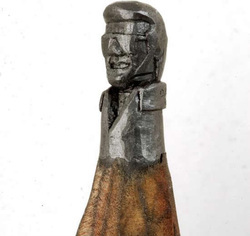 He carves these sculptures out of the tip of a pencil!! Go grab a pencil, and take a look at how tiny the tip of it is. Then try to imagine carving a sculpture out of it! 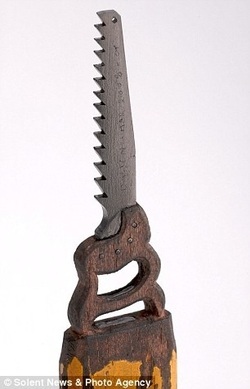 Ghetti says he uses three main tools to create his artwork: a razor blade, a sewing needle, and a sculpting knife. Can you imagine trying to create a sculpture using a sewing needle?! He does not use a magnifying lens, and he also has never sold his artwork; he will only give it away to friends. Want to see his work up close and personal?? You're in luck! 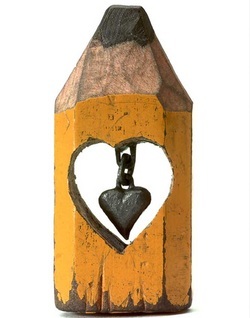 Dalton Ghetti's pencil sculptures are on display at the American Visionary Art Museum right here in Baltimore!